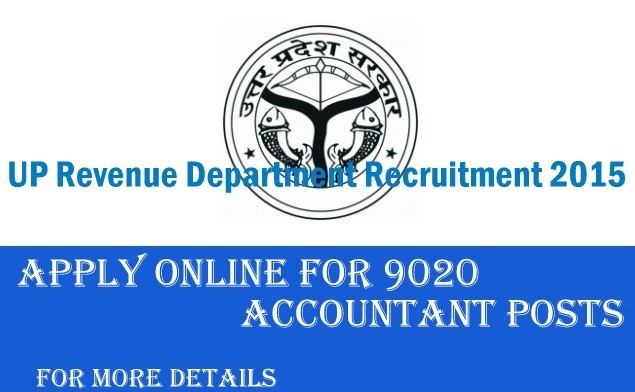 UP Revenue Department Recruitment For 9020 Accountant Posts How To Apply Online : UP revenue department inviting application for the 9020 accountant post. Now ,Revenue department of uttar pradesh give an excellent opportunities to the job seekers.anyone who are interested in govt jobs can easily apply for the accountant post, at todays period govt jobs are very difficult to found,so this is a golden chance for all eligible candidate.for more information plz visit official website of UP Revenue Department. The board of revenue department handled all the matters related to the REVENUE in uttar pradesh. Education : candidate must be 12th pass.